We did it again. Is it the luck of a coin flipping monkey or is there some other explanation. 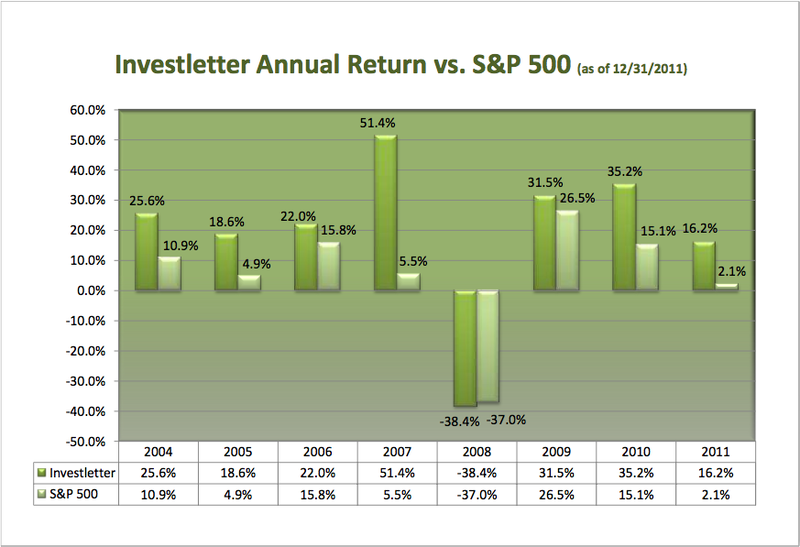 In 2011 our model portfolio returned 16.2% solidly outpacing the S&P 500 Average. The S&P 500 average, on an absolute basis, returned zero. When you add in the dividends for comparison purposes, the return was 2.1% In our first eight years of publication our model portfolio has outperformed the market in seven of those years. Our cumulative return over this same time frame is 250% versus the S&P 500′s 33%. 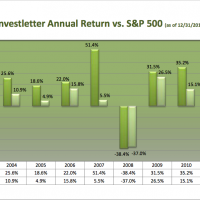 While we have only published the newsletter the past seven years, the same strategy has beaten the S&P 500 Average eleven out of the past twelve years (year ending 12/31/2011) and returned a cumulative 405% matched against a 7% return on an investment in the S&P 500. Check out the attached chart. We also measure our performance on our ability to double our money every five years. On this measure we failed to achieve are goal primarily because of the poor returns in 2008 for both the market and our model portfolio. Our model portfolio returned 92% over the past five years versus a 1% decline in the S&P 500 Average. Next year it will again be difficult to to accomplish this goal as we will need a 57% return in 2012 to achieve success. Very unlikely, but not impossible. We would like to publicly thank all of our subscriber for their loyalty over the past eight years. Their support is greatly appreciated.